Club Penguin Cheats by Mimo777 Club Penguin Cheats by Mimo777: Penguin of the Week: Allen47287! Allen47287 is a huge fan of PH and shares her love of puffles (let’s face it, who doesn’t love puffles?) His most favourite game is Jetpack Adventure and look, he’s even wearing a jetpack himself! AWESOME! Check out his igloo too, it’s all kinds of epic randomness! 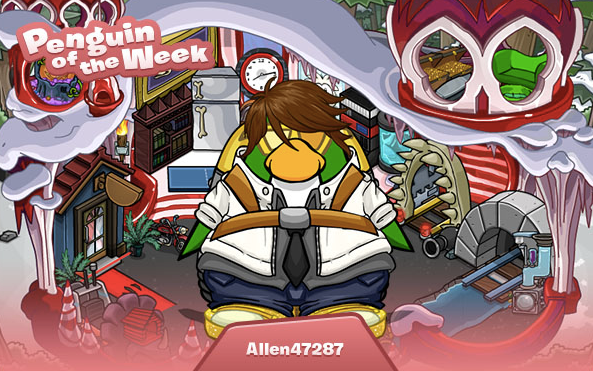 If you know someone who deserves to be Penguin of the Week, nominate them in the CP Blog comments! As you know 10,000 coins as well as the Green Viking Helmet are up for grabs! Cool beans!